Peel, core, and cut the apples into ¼” rings. Place sweet potatoes in a large saucepan with enough water to cover. Bring to a boil & cook 25 minutes, or until tender but firm. Drain, cool & cut into ¼” slices. Preheat oven to 350°F (175°C). Lightly grease a 7×11″ baking dish. In a small bowl, mix brown sugar, cinnamon & nutmeg. 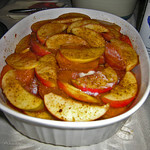 Layer sweet potatoes, brown sugar mixture & apples in the prepared baking dish. In a medium bowl, mix flour, brown sugar, butter & pecans. Sprinkle over the sweet potatoes. Bake in the preheated oven 30 minutes, or until lightly browned. This entry was posted in Dessert, Pastries and tagged all-purpose flour, apples, brown sugar, butter, cinnamon, Nicole~, nutmeg, pecans, sweet potatoes by Trish. Bookmark the permalink. I’m really loving your posts, please keep them comming, Thank You. I made this for Thanksgiving this year, but instead cut the apples and sweet potato in wedges. If you opt to do this, skip the boiling of the sweet potatoes. It was easier to do, not as pretty, but more of the brown sugar mixture coated everything and still super tasty! Awesome follow up tip, thanks Nicole!